Medium and fine sharpening stone. Sturdy molded base for medium stone. Built in storage area in base for the fine stone. New on blister card with full sharpening instructions on back. Total weight in packaging 320 grams. The Medium Stone comes mounted on a sturdy molded plastic base that features a built-in stone storage area in the bottom for the Fine Arkansas Stone. A bottle of Premium Honing Solution and a sharpening angle guide are also included. Large stone ~ 5" x 1 5/8" x 3/8" Medium 400 grit. Small stone ~ 4” x 1” x 3/8” Fine Arkansas 1000-1200 grit. 5 inch long block mounted medium stone to set your edge. 4 inch long fine Arkansas stone to finish your edge. Premium honing solution cleans and protects the sharpening surface. Small plastic sharpening angle guide for the correct angle every time. Push the blade away from you just like you were trying to cut a thin slice off the top of the stone. Use moderate pressure, let the stone do the work. Repeat this pushing stroke 3 or 4 times. Try to maintain the same approximate angle with each stroke. This is the key to obtaining the sharpest edge. Cleaning your stones will keep the pores free of stone and metal particles. After each use, the Arkansas stones should be cleaned by scrubbing vigorously with water, liquid soap, and a stiff nylon brush. 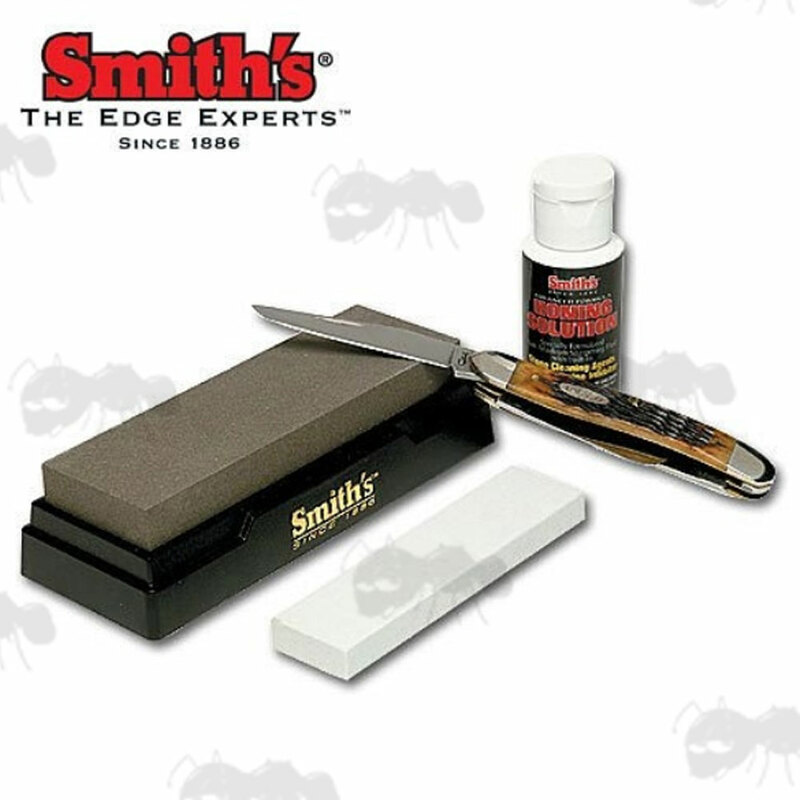 From our humble beginnings as a small Arkansas stone company to our current position as the market leader in the knife and scissor sharpening category, Smith's has become the fastest growing, full line supplier of great sharpening products. Our simple goal is to provide consumers with the best edge for whatever task they are performing, while also providing outrageously good customer service. We have the broadest line of knife and scissors sharpeners available, ranging from simple, fixed angle pull through sharpeners for consumers that want quick and easy sharpening, to sophisticated Precision Kits designed for the knife sharpening enthusiast. The following video by Smith's Sharpeners a rough guide to bench style knife sharpeners, but it focuses on their Tri-Hone model, not their 2-stone model we are offering above. Our offering includes both manual and electrical sharpeners that incorporate many different abrasive materials including diamond, carbide, ceramic, bonded synthetic abrasives and, of course, natural Arkansas stones. We are constantly striving to identify improved methods for providing consumers with the best edge as shown by our recent launch of an electric sharpener incorporating interlocking diamond coated wheels that insures a factory-sharp edge to your knife with only a few quick passes of the knife. We also offer designs that are appropriate for the field or for your gourmet kitchen.